How often does a child need to read? According to the Child Research and Study Center at the University at Albany, State University of New York, children should spend at least 15 to 20 minutes each day reading. The more reading children do, the more quickly they will develop as regular readers. That is why there is the special nonprofit organization called Traveling Stories. Founded in 2010, Traveling Stories caters to at-risk children to help them learn how to read and fall in love with reading. A year later, Traveling Stories created what are called “StoryTents,” a mobile literacy program providing special one-on-one reading attention and motivational encouragement to kids. 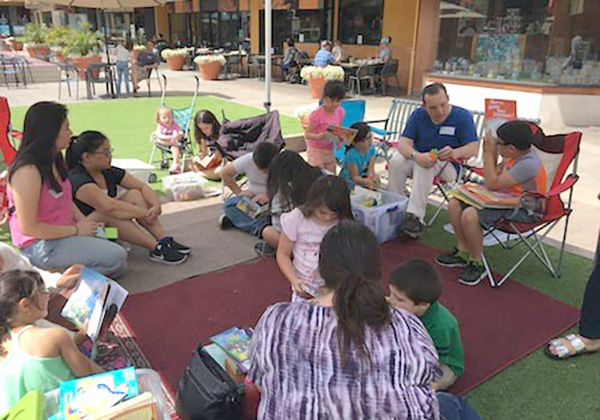 La Mesans have been able to take advantage of the local StoryTent at the Grossmont Shopping Center, and the next one at the location is scheduled for Sunday, Dec. 2 from 1–3 p.m. It is open to the public and everyone is welcomed to join in on all the fun. Traveling Stories is based in San Diego and has impacted the other side of the globe as far away as the Philippines. Every kid earns a “book buck” for every book they read. They are encouraged to negotiate for more bucks if the book is challenging and they can win prizes. This system helps motivate readers to pick up more books and also encourages them to manage their money as well. Traveling Stories serves kids from 2 to 12 years of age. In the U.S. alone, 82 percent of disadvantaged kids cannot read at grade level, according to Traveling Stories, and StoryTents serve more than 3,000 kids all over San Diego County. La Mesa’s state Senator Joel Anderson has been an avid supporter of this organization. He provided certificates of recognition for outstanding community service to its board members and volunteers earlier this year to celebrate their impact on our youth. “Traveling Stories has built a foundation geared towards success for all children not only in La Mesa and San Diego but also all around the world,” Anderson said. Traveling Stories is also looking for volunteers who can come help out at their local events. For more information, visit travelingstories.org. —Giann Ramirez is a legislative intern for Sen. Joel Anderson’s office.